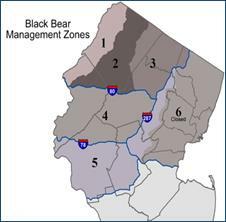 (15/108) TRENTON – The Department of Environmental Protection today formally adopted a black bear management policy that includes a continuation of the annual December hunting season, with expanded zones in areas where bear incidents have been increasing, and establishes an October hunting season beginning next year. The policy, previously approved by the New Jersey Fish and Game Council and signed by DEP Commissioner Bob Martin, was formally adopted as part of New Jersey Game Code through publication today in the New Jersey Register. The 2015 hunting season will take place December 7 through December 12. The hunting zone as approved in 2010 encompassed a roughly 1,000-square-mile area of northwestern New Jersey. This area includes all or portions of Hunterdon, Passaic, Morris, Somerset, Sussex, and Warren counties, and a small portion of Bergen County. Effective this year, the current zones in which hunting is permitted will be expanded to include the remainders of Hunterdon and Morris counties, a small additional portion of Passaic County, and a small portion of Mercer County. 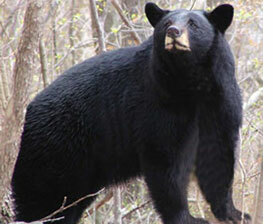 Bear hunting will also be extended to all of Somerset County, with the exception of Franklin. These expansions will help control the population in areas where reports of bear and human encounters have been increasing due to bears expanding their habitat. The Division of Fish and Wildlife is expanding education efforts in these areas to help residents and local officials understand bear behavior and reduce potential for conflicts. Adds an additional six-day October hunting season beginning in 2016, three days for bow hunting only and three days for bow hunting and hunting with muzzle-loading guns. Bow hunting will enable hunting of nuisance bears that can be difficult to hunt by gun in certain areas. Increases the allowable per-hunter harvest from one bear to two bears beginning next year, provided the first bear is taken during the October bow/muzzle-loading hunt and the second is taken during the December firearm hunt. Begins the process of developing an estimate for a statewide bear population. Re-emphasizes the importance of ongoing public education efforts, trash management and research. Efforts will be focused on urban areas and parts of the state where bears are expanding their range. The policy was developed after extensive research and review of five bear hunting seasons that have taken place since 2010. The Division of Fish and Wildlife determined that expanded hunting opportunities are necessary to reduce the population and to reduce conflicts with people. Research over the past five years that included surveys, captures of previously tagged bears, den studies, reproduction analyses and density analyses confirm that northwestern New Jersey continues to have one of the nation’s densest black bear populations and one of its most productive, with larger litter sizes and high cub survival rates. The population has not decreased significantly because reproduction rates, known as recruitment, have exceeded mortality from hunting and natural causes. The number of bears harvested in the five hunts has steadily dropped from 592 in the first season, to fewer than 300 animals in subsequent seasons, due in large part to poor weather at that time of year and a more wary bear population. In addition, the December hunt coincides with the time when bears are becoming less active and beginning to den. The December hunt, concurrent with the annual firearm deer hunting season, was purposely planned for this time of year to be conservative as biologists assessed the first five years of hunting.